4589 PX 1960 BEDFORD J5 water tender. Bedford 300 series 6 cyl. 5200cc petrol engine. HCB Angus bodywork & equipment. 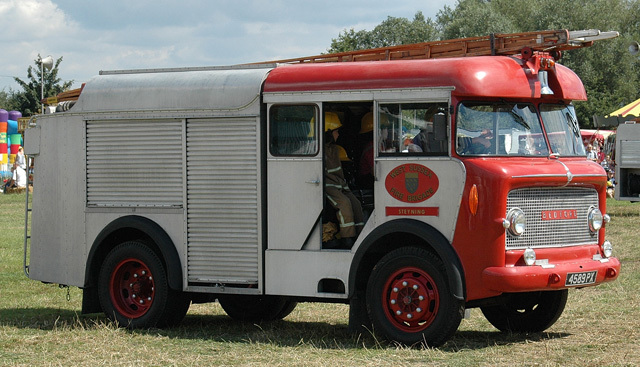 Supplied new to West Sussex Fire Brigade, and stationed at Steyning, where it served for 16 years. After a further 2 years at Storrington fire station, it was withdrawn from service and auctioned. It was subsequently sold for scrap, and for 10 years languished in Passey�s scrapyard at Benson before being recovered for preservation. My Grand-mother lived at Findon, nearby, 1954-1977. So this unit would have covered her village. Nice shot. Added by Pat_R-B on 29 March 2008. There was two of this type at Thornaby [a pump and a wheel escape] every time I see one it brings back memories of leaving my mum stranded when the siren went and I belted off to watch them come out. I was 6 and Thornaby fire station was an unmanned station. I dont know what happened to them. Added by Phil Lofthouse on 02 March 2009. Added by Ian Mcpherson on 02 March 2009. Unless someone can correct me, I believe the two Thornaby ones at the time of the merger into Teesside were 499APY a 1961 Bedford TJ5/HCB Angus WrT and AVN925B another TJ5/HCB Angus, this time a WrE new in 1964. I understand the old Thornaby Station was replaced in 1974 with a new build Fire Station near the Northern Gas Board vehicle depot on the site of the former Airfield. (Master Road I think?). This Station's first Machines were Dennis F108/Dennis WrL's TDC619/20M, the latter one of the pair TDC620M apparently still exists somewhere. Added by Chris Hall Teesside UK. on 02 March 2009. Added by Phil Lofthouse on 04 March 2009. If this has a Bedford "300" engine, the engine capacity is 300 cubic inches which is 4.9 litres. "Normal"(civilian) output was 113 hp. This is the same power unit which was fitted to the "Green Goddess" pumps. Added by Peter Goodall on 12 March 2015. Multiply the 300 by 16.8 will give you just over 5 litres. Added by Andrew Wright on 14 March 2015. The conversion factor is 0.0163871, which is 4, 916 cc or 4.9 litres. When I worked at Ford, we too juggled CID and litres all the time, just like our GM friends at Bedford. Added by Rob Johnson on 31 July 2017.